Have you ever considered owning a mobile home? 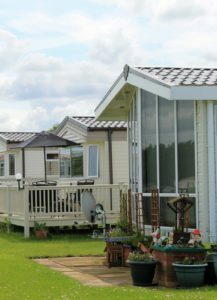 Mobile homes can be a great choice for many reasons, and today’s mobile homes often feature state-of-the-art designs that make them very comfortable and desirable. If you’re wondering whether or not a mobile home is right for you, here’s what you should consider. One of the top reasons to buy a mobile home is that they are usually less expensive than a site built home. Since they are constructed in a factory on an assembly line, the cost to manufacture them is considerably lower and these savings are passed on to buyers. Buying a previously owned mobile home will net you even more savings. You’re also likely to save money on your property taxes as well as maintenance and repairs. In addition to getting a break on the price, you’ll also get more space for your money. In fact, today’s mobile homes have quite a bit of diversity in terms of size and layout, and you can choose what works best for you and your family. Since mobile homes are semi-permanent structures, they have more flexibility than a traditionally built home. If you own the land on which you want to live, you can buy a mobile home and replace it down the line if you desire. It’s a great way to purchase a beautiful piece of land and still live on it while saving for a site built home. There are generally two options when it comes to finding land for your mobile home. The first, of course, is to purchase the land on which the mobile home will sit. Depending on the location, you may be able to purchase both a mobile home and the land together. The second option is to lease the land on which the mobile home sits, usually in a mobile home park in a residential area. If owning land is as important as owning a home, you’ll want to take these choices into consideration. Generally speaking, the land will appreciate in value over time, whereas the mobile home itself won’t. Have you been thinking about buying a second home? Mobile homes make great vacation homes, and more of them are popping up in highly desirable destinations. You may even be able to use the mobile home as a rental property for the times of the year when you aren’t using it. Not only will you save money by purchasing a mobile home instead of a site-built home, you’ll offset the cost even more with the addition of rental income. Finally, financing is an option if you want to purchase a mobile home. The Manufactured Housing Program from the Department of Housing and Urban Development has several loans that are available for mobile home buyers. One of the programs is the FHA Title I Loan that can be used for buying or refinancing an existing loan. With the information outlined above, you can make the decision about whether or not a mobile home is right for you. While they may not be the best choice for everyone, they are a great option if you’re eager to become a homeowner.